By the late 1970’s the Academy had been pursuing a decades-long desire to be recognized by the ADA as a specialty. The Academy leadership decided that to further this aim it was important that we act like a recognized specialty. Accordingly, the Executive Council of the AAOMR decided to establish an American Board of Oral and Maxillofacial Radiology (ABOMR). While the Academy already recognized individuals who had special expertise as Fellows (Individuals qualified as Fellows following an examination process similar to a Board examination.) , the AAOMR decided to move in the direction of the recognized specialties and establish a Board. The objectives of the Board were to elevate the standards of oral and maxillofacial radiology to promote optimal health care. To this end, the Board would endeavor to improve the quality of education and knowledge of oral and maxillofacial radiology for members of the health professions. The first step was the appointment of a task force to establish a process to form the Board and determine guidelines for Board operations. The committee consisted of Donald D. Weissman, Barton M. Gratt, Robert P. Langlais, Stephen R. Matteson and Stuart C. White. The committee report defined the conceptual framework for the structure of the Board and established the process for its formation. The next step in the process of establishing a Board was for the Executive Council of the AAOMR to elect founding members of the new ABOMR. This was done by nominating a slate of five individuals and seeking approval of t his slate. 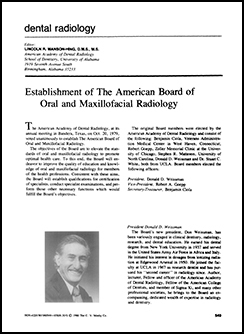 At this time there was a consensus to select founding members who represented both current leadership as well as younger “up and comers.” Accordingly, the American Board of Oral and Maxillofacial Radiology (ABOMR) was formed on October 20, 1979 at the Annual Session in Bandera, Texas with Donald D. Weissman as President, Robert A. Goepp as Vice-President, Benjamin Ciola as Secretary/Treasurer, Stephen R. Matteson and Stuart C. White as Directors. A public announcement of the founding of the Board was made in 1980. There were several issues that the Board faced. Among these were its own structure, the criteria for recognizing individuals for Board membership by credentials, and recognition of Honorary Members. Don Weissman’s expertise in by-law writing was instrumental in the publication of our founding by-laws. Ben Ciola, the Secretary-Treasurer, incorporated the Board in Connecticut (filing fee of $39), where he was a faculty member at The University of Connecticut . Ben also selected the green marble “cubes” presented to Diplomates to this day. We also learned that Bob Goepp was an accomplished pianist and Don Weissman was an excellent swimmer. The new Board set up a structure whereby each member would serve for two years; then members would rotate off and be replaced annually by new members elected from the Academy membership. The initial two-year term was intended to provide stability while we established our procedures. An interesting issue came up regarding how to certify the founding members. We decided to announce certification of one another with one vote. With that vote Diplomates #1-5 came into existence on October 23, 1981. The founding members also decided to rotate off the Board in age order with the eldest serving the shortest term (two years) and the youngest the longest term (six years). Our age order was Don, Bob, Ben, Steve and Stu. The sequence of the Presidency of the first six years of the Board was Don (twice), Ben, Steve and Stu (twice). The most challenging task for the founding Board was to establish criteria for certification of specialists. We determined that Board membership would be awarded to individuals who presented evidence of superior attainment in the fields of radiation physics, radiation biology, radiation safety, and diagnostic radiology. Interested individuals could demonstrate such achievements by their records in scholarship, teaching experience, and clinical experience. To this end the Board established a two-year window during which individuals were encouraged to submit their CV and any supporting documents to the founding Board members. In 1980 the ABOMR accepted applications for Certification of Diplomate status based on 1) appropriate credentials, or 2) credentials and an examination. It was a difficult responsibility to review the credentials of colleagues but the high quality of the materials received made the task largely straight-forward. In 1981 28 Diplomates were admitted to the Board through this process. In 1982 another 37 Diplomates were also certified by credentials. It is interesting to note that a number of new Diplomates were from overseas. Their membership has helped to establish the international stature of the Board. A more delightful task was to identify individuals to be recognized as Honorary Diplomate for their prior substantive contributions to the field of Oral and Maxillofacial Radiology. This status was awarded to Edward C. Stafne, Donald T. Waggener, Samuel S. Wald, Harry M. Worth, and Arthur H. Wuehrmann in 1981 and to Harrison M. Berry, H. Cline Fixott, Jr., H. Guy Poyton, William J. Updegrave, and William F. Via in 1982. In 1983 the window for certification solely by credentials closed and the first Board examination was conducted at the UCLA School of Dentistry. During 1983 and 1984 some applicants were deemed certified by some, but not all, criteria. These individuals were asked to take a limited examination to demonstrate competence is the areas in which their record did not document expertise. Other applicants took the entire examination. From 1985 onward all applicants took the entire examination. The Board took another step when it decided in 1988 that certification from a radiology training program was an indispensable requirement to sit for the Board examination. Although it was long overdue, in 1999 Oral and Maxillofacial Radiology achieved specialty status from the American Dental Association to become the 9th recognized Dental Specialty. The Board has thrived since its founding days and the vision of the members of the Academy and early Board continues to be amply fulfilled. –Prepared by Stuart C. White with contributions by Stephen R. Matteson and editing by Kevin O Carroll and Axel Ruprecht.